Despite the fact that the Italian cinema became extremely popular during the decades of 60s and 70s it still has some hidden gems and lesser known auteurs. A characteristic example could probably be Gian Vittorio Baldi. He is one of the pioneers in the field of the documentary, founder of IDI (Istituto Documentario Italiano / Italian Documentary Institute) and collaborator of Michelangelo Antonioni, Florestano Vancini and Vittorio De Seta. Baldi was recognized as a Cahiers du Cinéma favorite but at the same time he was excluded in his homeland by the censors and the market. He was also producer and personal friend of Pier Paolo Pasolini, Robert Bresson, Danièle Huillet and Jean-Marie Straub. 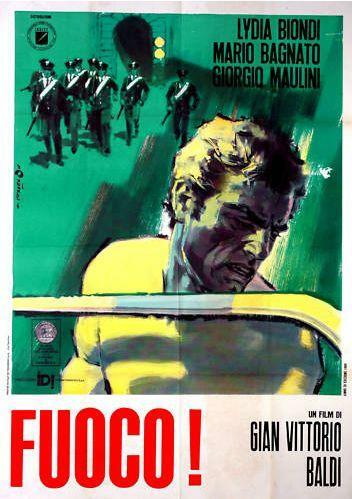 His most important directorial work has been the political drama Fuoco! (Fire!, 1968). The film participated in the 29th Venice International Film Festival and was awarded with the Silver Osella. The story takes place in the village Capranica di Sutri, in the province of Rome, the day of the Assumption. During the festivities someone shoots the statue of Virgin Mary. An unemployed builder, Mario (Mario Bagnato), is armored and locked up in his house and from there he opens fire to the people. He keeps hostages his pregnant wife (Lydia Biondi) and their little daughter. Mario does not want to talk to anyone, nor to the policeman (Giorgio Maulili) who trying to negotiate, nor to a reporter who is requesting an interview with him. Everything will happen during a dramatic and tormented 24-hour. The title, Fuoco! / Fire!, could straightforwardly sum up the basic concept of the story, because this is a film that is fighting against everyone and everything. The rapidly developed bourgeois society of the late 60s drove many of its members to a marginalized path and Mario is a clear representative of this newly formed lower class. The marginalization will fill him with anger and this will inevitably lead him to extreme solutions and of course violence. A complete new society is formed and Baldi is using his hero to criticize these changes without analyzing any further the reasons behind Mario’s decisions. Clearly influenced by the spirit of the social and political changes of 1968, the director observes and presents the outcomes of a revolutionary process. Obviously the idea of a social revolution it is ignited by the mistakes that were made in the past. With that thought in mind, Mario justifiably believes that the past is responsible for his situation and therefore should be destroyed. For that reason he must initially depose the Holy Trinity of the postwar Italian dream: State. Religion and Family. Those he once believed as theoretical saviors were proved inefficient and now they have become his enemies. In order to have a future, he should have a new start that will begin from scratch, so necessarily he must destroy everything that already exists. Unfortunately, Mario’s unrestrained wrath to deconstruct everything will unavoidably lead him to self-destruction since it is, apparently, the only solution to his tragic life. Baldi, who also wrote the story, the screenplay and produced the film, does not hide his very obvious neorealistic influences and of course his experience in the documentaries. By using just one hand-held camera he delivers a film that is raw and substantial at the same time. Fuoco! is a gritty powerful minimalistic kitchen sink drama. With the exception of the initial exterior shot the rest of the story evolves strictly inside the house. The director always keeps the perspective from the inside towards outside, so the viewer can feel at the same time both close to the heroes and detached from the actual events. The camera stays always focused on Mario, he is the hero, he is the center of attention, he is the one that you should be identified with, he might already be you. There are no substantial dialogues, since no one is really talking to anyone; there are only some random typical quotes that they always remain unanswered. Mario will not talk, words don’t express him anymore and he has gone into action. This austere technique and character development gives an unblemished natural feeling to the film. This is also a main difference between Baldi and his fellow politicized filmmakers of this era. While they were trying to seek and explain the sociopolitical phenomena around them or even affect them, Baldi captures and presents the impactful actual facts. Filmed more than 45 years ago, Fuoco! remains extremely contemporary today. The theme feels so compatible with the existing social changes and the film could still be an actual record of what is happening now around us. The bleak representation of a past reality that doesn’t seem that distant anymore leads to horrifying understanding of our almost unchanged present. Gian Vittorio Baldi created a remarkable balanced piece of art that through its unique internal consistency can work both on political and dramaturgical level without losing its dominant realistic expression.